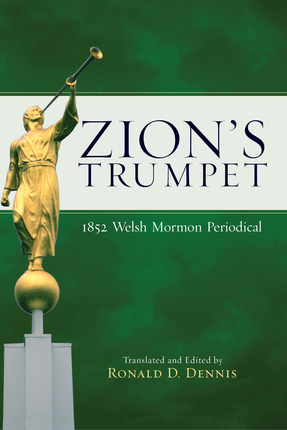 The twenty-six issues of the periodical Zion’s Trumpet that were published during 1852 kept Latter-day Saints all over Wales abreast of the latest direction and information from their leaders in Merthyr Tydfil. They could read translated minutes of conferences held in Salt Lake City, instructions about emigrating, letters from those who had already left Wales for America, answers to their doctrinal questions, inspirational messages from the editor, John S. Davis, poetry composed especially for the periodical, and even bits of humor and wisdom. Today’s reader of the “facsimile translation” of this volume can gain insights into the Mormon movement in mid-nineteenth-century Wales and a clearer understanding of the challenges the converts faced in living their new religion. After thirty-five years of teaching Welsh and Portuguese at Brigham Young University, Ronald D. Dennis is now happily retired, and resides in Provo, Utah, with his wife, Grace Marie. Much of Professor Dennis's forty years of research on the history of the Latter-day Saints in Wales is now available on the Internet at http://welshmormonhistory.org. Professor Dennis's other publications include The Call of Zion: The Story of the First Welsh Mormon Emigration; Welsh Mormon Writing from 1844 to 1862; A Historical Bibliography; Prophet of the Jubile; Zion's Trumpet: 1849 Welsh Mormon Periodical; and Defending the Faith: Early Welsh Missionary Publications. He also wrote and privately published Indefatigable Veteran: History and Biography of Abel Evans, a Welsh Mormon Elder.